Trim the prawns and rinse well. Pat dry with kitchen paper towels. Toss in tapioca flour and set aside. Heat enough oil in a wok and fry shredded ginger until light golden and fragrant. Remove, drain on absorbent paper. 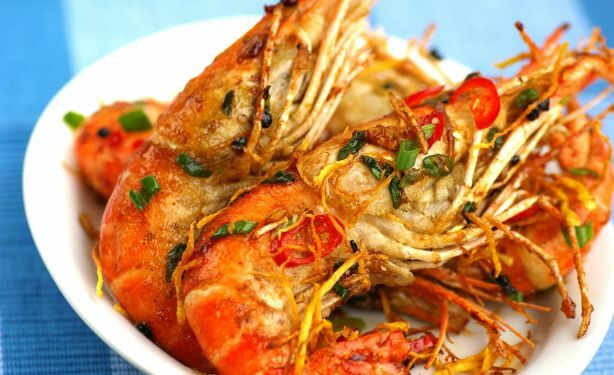 In remaining hot oil, deep-fry the prawns, in batches, until their colour changes. Dish out and drain from oil. Heat a clean wok with 1 tbsp oil and sesame oil, and fry garlic, salted black beans and bird’s eye chillies until fragrant. Add seasoning. Return prawns to the wok and add red chilli and spring onion to mix. Stir-fry briskly over high heat until well combined. Dish out and serve.